Propoza is quotation and proposal software for e-commerce platforms, such as WooCommerce, Prestashop and Magento. As Magento 2.0 launched on 17 November 2015, we also launched a new Propoza version fully compatible with Magento 2.0. In this blogpost we want to update you on the features of Propoza, new functionality and what you can expect from us in the feature. Say, you’re a web shop owner and you would like to offer quotation functionality to your (potential) customers. How can Propoza help you with just this? What are the features? And how does this improve your sales? Start by signing up and downloading Propoza for free. Installing Propoza adds a bit of code to your website that communicates with our API. It’s really quite simple, no need to have any coding experience or know-how before you can start. 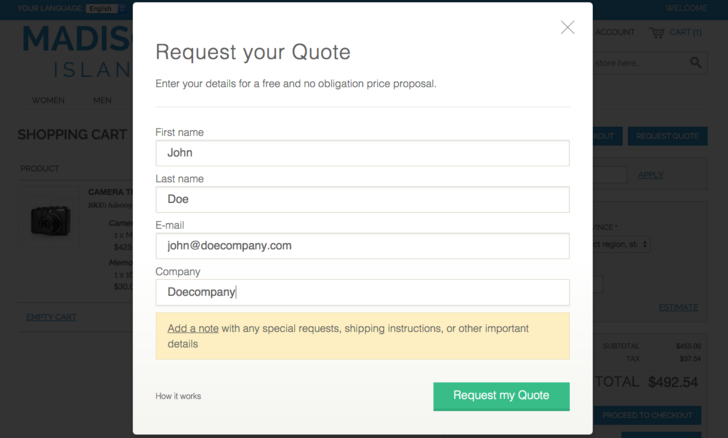 In the end, your customers can request a quote and you can send a proposal. You can customize the look and feel of your proposals with the Propoza customization options. When you’re done, your customers can add products to their shopping cart, but instead of needing to ‘buy now’ they can also ‘request a quote’. When they choose to request a quote, they need to fill in the quote form. You, the shop owner, will now automatically receive a notification that someone is waiting for a proposal. Simply log in to your web store’s backend. In our new release, it’s now possible to have your Quotation Dashboard embedded in your webshop’s backend. Otherwise, you’ll still have an overview of all quote requests via your Propoza account. Simply select the request you would like to create a proposal for. Before you send out proposals, you can customize the layout of the PDF’s and proposals you want your customers to receive. From your backend you can go to the General Settings and upload your company logo, add your Company details, T&C’s text, manage translations et cetera. 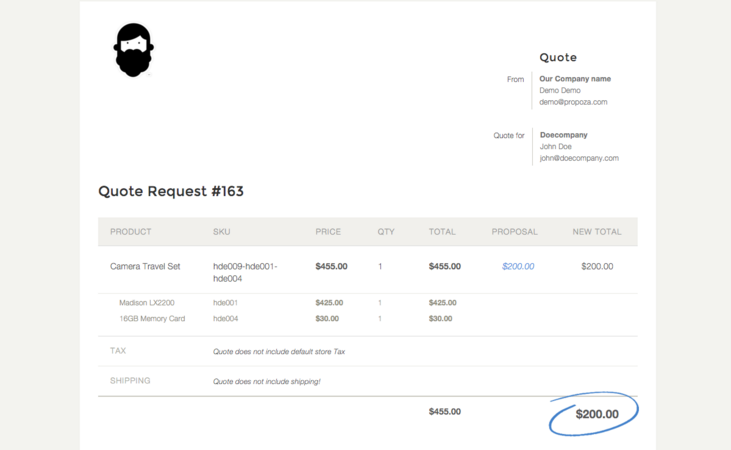 When all those customizations are done, you can simply change the price and send it back to your customer. Send it as an email or even as PDF, your choice! All from your existing backend! It’s really as simple as that. Your customer will receive your custom price proposal. Now hopefully, he’s indeed happy with the price and he clicks the “accept” button. Depending on your platform and plan he can either simply continue and check out with the new price, or you will receive a new notice and can create the order from your backend. Of course, sometimes customers might “decline” your offer. They can simply add a reason to that. It might be they want a cheaper deal or still have some questions about shipping. Propoza will help you with these kinds of negotiations so you can simply create a new proposal with all the existing client- and product details. Instead of leaving your website because they can’t commit directly, your customers can now ask for custom price proposals. This will actually help you to serve your customers better and will improve your sales! – Magento 2.0 compatible. Magento has released their new platform, Propoza is now fully compatible with this as well! – Quote Only Mode. We’re working hard to make it possible for you to hide your “add to cart” buttons so you can actually have a “quote only” webshop. Great for B2B webshops! Want to get started for free? Create a free account and get selling more!